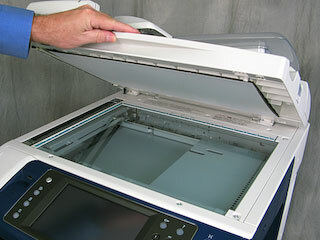 Clean the Document Glass often to make sure that the copies are of the best possible copy quality. 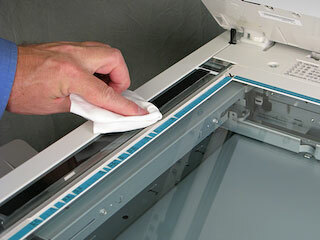 CAUTION: Use only water or Lens and Mirror Cleaner to clean the Document Glass. Pour the cleaner on the cloth. Do not pour the cleaner directly on the glass. Cleaning the machine with an excessive amount of water may cause the machine to malfunction. Dampen a lint-free cloth with water, Anti-Static or Lens and Mirror Cleaner. Raise the Document Feeder Cover. 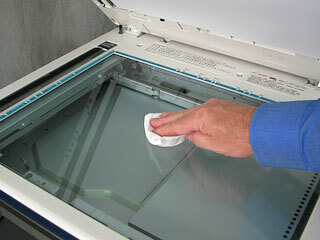 Clean the Document Glass and the CVT Glass (on the left) as you would clean a window. Make sure that you clean the corners as well. If necessary, use the edge of a plastic card to help remove dried correction fluid or other substance from the CVT Glass. Wipe off any excess moisture with a dry, lint-free cloth. 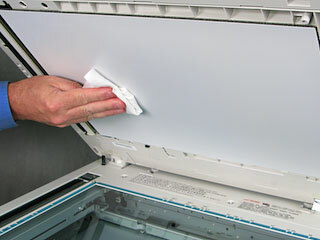 Dampen a lint-free cloth with water, Xerox Cleaning Fluid or Lens and Mirror Cleaner, and then clean the underside of the Document Feeder Cover and in the feeder, if necessary.